Steamboat Springs is an idyllic mountain destination known for its breathtaking natural scenery, its natural hot springs, and its renowned skiing. This Colorado mountain town attracts visitors year-round, because there's always plenty to do and see in Steamboat. Whether you're planning a mountain getaway with your significant other or are planning a kid-friendly family vacation, you should let Vacatia help simplify your planning process. Any avid traveler knows that one of the hardest parts of trip planning is finding the best accommodations, but Vacatia makes this the easiest part of planning a vacation. Vacatia provides travelers with high-quality vacation rentals in some of the world's most popular destinations, such as Steamboat Springs, where you're sure to feel right at home in Steamboat Springs. If you want to plan a vacation that doesn't break your budget, Vacatia can help you find some of the best affordable Steamboat Springs lodging around. So let Vacatia take the reins and help you plan a one-of-a-kind mountain getaway you'll never forget. Steamboat Springs is nestled in the majestic Rocky Mountains in Colorado, and it's known as an outdoor lover's playground. During the winter months, Steamboat becomes a snow-covered wonderland, where skiers and snowboarders enjoy some of the best slopes in the country. During the warmer months, visitors flock to Steamboat to soak in the fresh mountain air, go fishing on the lake, and experience some of the best hiking in the area. No matter what you have planned for your trip to Steamboat Springs, you should work with Vacatia to book your accommodations. When you stay at one of Vacatia's two-star resorts in Steamboat Springs, you will have access to desirable resort services as well as home comforts like a fully equipped kitchen. Vacatia's unique properties blend the space and comfort of a home with the luxury of a resort, and you can have it all at an affordable price thanks to Vacatia. So if you want to find the perfect home base for all of your mountain adventures, simply rely on Vacatia. As one of the most popular mountain destinations in the country, Steamboat Springs boasts an abundance of activities, entertainment, and natural beauty. Downtown Steamboat offers great dining, shopping, and nightlife, while the surrounding mountain provides exceptional skiing during the winter and hiking during the summer. Widely known for its fluffy, fresh snow, which has been nicknamed "Champagne Powder" snow, this is a dream destination for any avid skier or snowboarder. However, Steamboat summers are just as fun, as visitors can go kayaking and rafting down the Yampa river, experience the excitement at a rodeo, and explore the mountain's many hiking trails. Whatever you have penciled into your Steamboat Springs itinerary, you should ensure that you have a great home away from home in this Colorado mountain town. 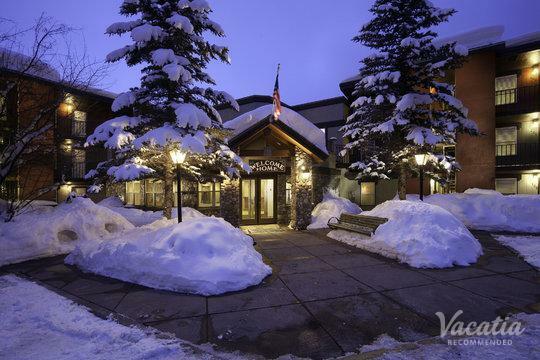 Let Vacatia help you find the perfect two-star resort in Steamboat Springs so that you can focus your energy on exploring all that this popular mountain town has to offer.